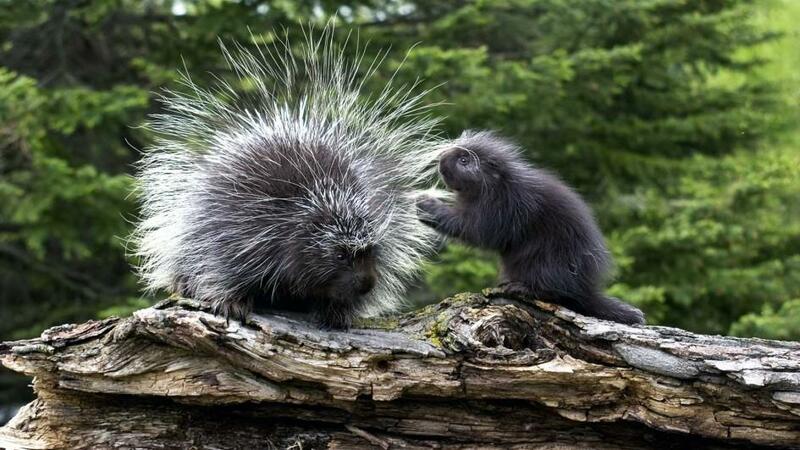 As many as 30,000 needle-sharp quills cover the upper parts of the porcupine’s body and tail. These hollow, barbed quills, actually derived from hairs and modified for defense, attach loosely to the skin. A porcupine cannot throw its quills, but can erect them, and the quills detach easily, penetrating the skin of any animal touching this large rodent. The thick muscular tail can drive the quills into an opponent, and it is a formidable weapon when flailed suddenly. If the tail strikes a hard object such as a rock, quills may be dislodged and fly through the air, one likely origin of the quill throwing myth. The mechanical action of the barbules in moving muscles draws a quill deeper into the tissue of an opponent, where it may produce fatal injuries by puncturing major blood vessels or vital organs. A stout, compact body, small head, dull black eyes, short ears and course brown to black fur tipped with white, are additional characters of the porcupine, also known as the quill pig. Prop-like bristles on the undersurface of the tail function as a brace for climbing. Roughened foot pads, and strong, curved, claws are other climbing aids. Adults are 64-102 cm (25-40 in) in length, and weigh 4.5-9.1 kg (10-20 lbs), occasionally 18 kg (40 lbs). The semi-arboreal porcupine does not hibernate. During the winter it travels from the den to a nearby tree to feed, sometimes visiting the same tree for days or weeks, and reaching it following a well-worn trail over the snow. To reach its food, a porcupine climbs trunks and large branches, and propped in place with its tail, hind feet grasping the bark, uses the forefeet to gather twigs and foliage, or to clasp the trunk while gnawing bark. Pieces of bark, twigs, droppings, and in the case of conifers, needles, litter the snow beneath a tree in which a porcupine forages. It descends by backing down trunks Falling out of trees, (relatively common in porcupines) often results in bone fractures which heal quickly. Porcupines are mainly active at night. They can swim but rarely enter water, and then only to gather aquatic plants which they carry to shore to eat The typical gait on land is an awkward waddle, but porcupines can run short distances. Intruders elicit quill-raising and tail-thrashing. A porcupine defends itself by trusting the vulnerable head into a root crevice, or beneath a log or rock, but when approached in the open, constantly shifts its position to orient the back and tail toward a potential source of danger.